When it comes to moving a house from one country to another, most people lay emphasis over the internal factors such as move related finances, fast approaching deadlines, general organization and finding the best international shipping company. Very few people think about the influential external factor – the perfect season for the residential move and how it will affect their decision-making process and the overall outcome of their moving adventure. Summer is considered to be the most popular season for people to move, the movers can come across many pleasant and unpleasant surprises. Take a closer look at the top tips for moving in the summer and witness how a single smart summer moving choice of yours can tip the scales in your favor. Learn the best way to prepare for a summer move so that you benefit greatly from your ultimate decision to move during the peak moving season. Favorable Climatic Conditions: The weather is actually pleasant in summer for there is the lack of snow and ice. The sub-zero temperatures automatically turn your moving project a few degrees safer and more efficient than the cold months. However, the summer weather too can be rather unpredictable, heavy rain, extreme heat or even storms can occur anytime. More Free Time: Majority of people spend their vacation days and remain away from work in the summer months, so you’ll have more time to organize and possibly even execute a house move. Also, moving in the summer means more friends or relatives willing to give you a hand. School: Summer is considered to be the most opportune moment for families with children to move to a new city with minimum disruption of the academic year. PLANNING IS EVERYTHING – Irrespective of which season you choose for the move, timely organization is the most important factor to consider. The fact is, if you desire a hassle-free summer move, then you have to plan and execute your steps carefully from Day 1 until the last day. avoid the build-up of the notorious moving stress simply by assuring you that you’re right on schedule. distribute your tasks in a way that makes perfect sense for you, and thus aid you in completing them one after the other without wasting any precious time. WHAT’S YOUR BUDGET? Professional moving companies tend to levy more charges during the summer season. As a result, one should absolutely learn how to manage the finances as it might happen that where you were supposed to spend less, you will end up spending more or vice versa. And the best way to keep a check over it is to set a moving budget. explore alternative funding options such as selling some of your items prior to the move. YOU MUST CALL FOR HELP – In most of the relocation cases, moving a house is a stressful affair, in the summer month, it’s no exception. Moreover, moving during the peak season will present more challenging situations due to the increased expenses, tougher choices of trustworthy professionals, and possible scheduling problems. Therefore, it is highly recommended to hire the services of the best international shipping company in New York, for they can make a big difference in the course of the entire move. Trained professionals will handle the difficult details of your summer move with an enviable speed, and most importantly – with an excellent level of safety both for your prized possessions and your property. To execute a hassle free move, seek professional guidance and assistance from the experienced team of Moving of America – the best international shipping company in New York. Lastly, summer weather is notorious for changing too quickly, so make sure you keep a check. The process of moving from one city to another with all the belongings and memories is a very personal thing. But when it’s time to pack up and move your house, the moving case shall also be different. It might be confusing to understand how the whole packing of gadgets takes place, and what you as the customer needs to do before the movers come and pack and ship your electronic goods. However, what packing supplies you will need for your desktop computer, monitor and peripheral devices – keyboard, mouse, sound speakers, etc. will be taken care by the team of experts appointed by Moving of America – a reliable company in New Jersey specializing in residential moving services. 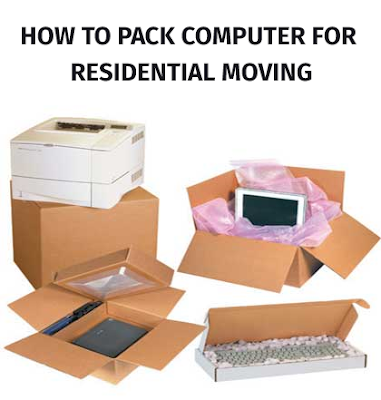 Read special packing tips for packing a computer quickly, efficiently, and of course – safely. How To Prepare Your Desktop Computer For A Move? Computer or laptop is a highly valuable item in any home – especially if it’s a high-end PC that costs plenty of money. But information stored inside the computer’s hard drive (work documents, photos, special projects, etc.) is more valuable than the computer itself, so before you learn how to pack a desktop computer for moving, learn how to take the back up of the important data that has been stored inside. STEP 1: BACKUP YOUR DATA: The very first step is to take backup of your important data, preferably twice. You can do the same by once uploading the important info to a cloud storage service and then by transferring those files into an external hard drive if you have one. STEP 2: MEASURE YOUR COMPUTER: Make sure that you take the measurement of your computer tower and the monitor. Once you know their approximate sizes, you will be able to choose packing boxes of the right size. STEP 3: REMOVE THE CABLES: Take a quick photograph of the way all the cables are connected at the back of your PC. And then start removing and keeping the bunch of cables hanging behind the computer mid-tower and monitor safely. STEP 4: DO NOT DISASSEMBLE YOUR COMPUTER: The risk of damaging a computer part by having to disassemble it is higher. Instead, pack the entire computer tower or let the professionals of New Jersey residential moving services company do the same for you. How To Pack Desktop Computer For Moving? Step 1: Turn off the computer. Step 3: Place a few layers of bubble wrap on the bottom of the computer shipping box to serve as a large initial cushion. Step 4: Wrap the disconnected computer tower with large sheets of soft packing paper and secure the newly-formed edges with tape. And then cover them again with bubble wrap. Step 5: Cover the strategic spots with tape. Step 6: Place the PC in the cardboard container. Step 7: Fill the gaps with whatever cushion supplies you have. Step 8: Lastly, lift the box and shake it gently to test a little that the PC is not moving, thus avoiding any sort of damage. Tip 1: Soft packing paper should always be your initial protective layer. Tip 2: Use bubble wrap to pack your more fragile peripheral items when packing the computer for the move. Tip 3: If it is possible, use original packages of your PC accessories. Tip 4: Good cushioning is probably the most important step when packing a computer for shipping. Tip 5: Be careful when handling the cables, sort them out and organize them neatly with the help of zipping ties or rubber bands. Step 1: The most delicate part of the computer is its screen, hence, packing the screen is the trickiest part of your computer packing job. Step 2: Remove the stand and pack it separately in paper first and then in Bubble wrap. Step 3: Wrap the monitor with sheets of packing paper. Step 4: Place one large piece of bubble wrap over the entire screen so that the display is covered completely. Step 5: Again place one large piece of Bubble wrap over the entire screen. Step 6: Place the protected monitor into a cardboard box of the right size in an upright position. Step 7: Fill the remaining gaps if any with cushions. Step 8: Close the lids with tape and shut the box. The above-mentioned computer packing guide is the best way to pack a computer for moving. Follow these steps and be assured that your favorite piece of electronic equipment will not get damaged during the move, or appoint our expert team experienced in residential moving services in New Jersey, for best and effective results. Moving your business to a new location can be challenging. Hiring the best business mover in New York offering reliable moving services and being clear about the exact activities you need to perform are crucial for your success. That is why its highly recommended to seek help from a reliable and experienced commercial mover just like Moving of America to receive important advice from a team of experts. 1. CHOICE OF MOVERS – The most vital decision to take is to choose a professional business mover. Get at least three quotes from different moving companies. Keep in mind the majority of moving companies offer reliable residential moves and provide occasional commercial moving services. Moving of America in New York has successfully completed many commercial moves. The team of experts has knowledge of many local office buildings and their policies and requirements. Moving of America also provides on-site quotes, ensuring there are no “hidden surprises” after an estimate is given. START PLANNING EARLY: The earlier you begin your preparation, the better and smoother the moving process will be. HAVE A REALISTIC APPROACH: Before implementing any business relocation plan, be clear about why you are moving your business. It would be better if you have clearer idea about whether or not you want to merge departments, hire more people or lower the rent of the new premises. All of these information would help you prepare the business moving plan. PREPARE COMMERCIAL MOVING PLAN: Prepare business moving checklist that contains the tasks to be done, a deadline and any other special conditions that apply. KNOW WHAT YOU WANT: Be ready with the answers to the key questions for your move – knowing precisely what you want will help you get it much more easily. KEEP ALL THE RECEIPTS of the move – you may be able to deduct some of the expenses from your taxes. 2. MOVING PHYSICAL ITEMS – The storage units and the office furniture are usually too big and heavy, hence it becomes hard to handle them especially through doors and on stairways. If you move them yourself it might end in physical injuries or your landlord may levy penalties if floors and walls got damaged. Professional business movers like us have the right equipment, specialized items like door jamb protectors along with expert personnel to ensure that the furniture is moved safely. Option 1: Per Pound Per Article Basic Valuation Coverage: This type of evaluation is provided at no additional cost to our clients. In such type of valuation, if the item gets lost or damaged, the total amount that the client is liable to recover is $0.60 per pound per article. Option 2: Additional Valuation Coverage: In such type of valuation, the client has to declare a lump sum value for the entire shipment if he/she wishes to pay only the depreciated value of the damaged or lost items. This type of valuation is offered at an extra charge of $0.80 per $100 of declared value. Option 3: Full Replacement Value Coverage: In this type of valuation, a third moving insurance company, offers full replacement value directly to our clients. This coverage option is more involved and needs to be obtained prior to the actual move date. It is much more like a comprehensive coverage than Valuation, and generally, offers more options such as deductible levels and higher coverage. You are the expert in your business, business movers in New York are the experts in theirs. 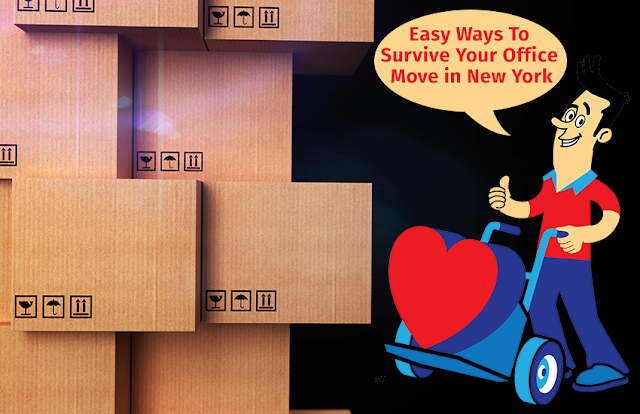 Let Moving of America make your office move a seamless, stress-free success. Packing your home office can be like moving a room full of fragile items. With files and other important documents, an office is something you want packed correctly. Your home office is one of the most important place in your home because this is where you are keeping your working documentation, where you’re working, and also probably the place where you sort out the bills, checks, monthly payments due, etc. Here are our office moving packing tips. The first thing that you will need to do is buy some book boxes. You need to be sure to get the right moving supplies for our office move. Documentation and office equipment are all heavy so look for sturdy boxes. Ask the moving company to provide you with some office packing supplies. It’s good to have the office packing boxes, tape, paper, etc. before you begin to pack. Decide if you want to do it yourself or call a moving company. If you’re planning on packing home office on your own start early. As soon as you know everything your are taking in your office start packing immediately. You want to have everything ready by the time your move day arrives. It’s recommended that you take out all the content of your office desk and any other furniture that you may have in your office. If the movers pack for you, you can relax and just guide the process. Movers can handle packing your office much more quickly than you naturally because of their experience and professionalism in the packing. Don’t keep very old archives or useless papers. They’ll just put on more weight on the boxes for which you have to pay the transportation. Be sure to throw away all useless paper work or archives to minimize your cost. Make sure to label all your document boxes in alphabetical or chronological order, or in another way convenient for you. When packing books don’t overload the boxes. Boxes can get really heavy real fast when putting books inside them. You should try and distribute the books evenly by placing a few books in a box and filling the rest of the box with lighter items. Packing the home office books in large boxes will make them difficult to carry for the movers and may cost you additional charges. Never place any glass or fragile items in a box that is carrying books. Always place books upright or on their side depending on the box and size of the books. Try to always keep in mind that the box need to balanced. Placing large and heavy books upright or on the sides can severely damage them. When you start a moving service your quote may be a lot lower then your final bill. Here are a few reasons why.Utilities: Whenever you start up a moving service, you’ll discover you need to pay for additional fees depending on the company. Some companies will charge you additional fees for the equipment used along with the fuel charge that can come unexpectedly. Some companies will give you hidden costs for almost everything. A full moving service contains within it packing and the materials. The full packing material and packing service should be included when dealing with these kinds of services. However, this service may not always include the final cost to the end result of your move. Many moving companies tell you that the moving service are free when indeed they are included in the final estimate which will also leave you subject to other fees. They will charge you additional fees for having extra boxes along with doing extra crating. Usually companies tell you that the item that you have may need extra packing along with extra materials to keep it protected. They may want to keep your business so they will not add it at first but give you the fee later on during the day. They may also get you with the moving insurance. When you sign your bill of landing, you automatically get basic coverage. called valuation) from $0.30 to $0.60/lbs for items. Some may charge you for this separately as a hidden fee. Others Many coffer Full Value Protection this is ultimate moving insurance that guarantees reinstatement and replacement valuation for damages and missing items. Always remember that it will cost more money to do this moving insurance. Some moving companies will charge you extra for the packing that you had done for the boxes. They may change you more money of over sized boxes as well as unexpected moving cost. Another moving cost can spring up once there are pool tables and motorcycles, wall units and pianos. All these extra large items can be used to bump up your final moving quote. Here are a few important tips for packing up the office: take care of your electronics. Make a back up of all the data on your computer(s). Secure your equipment when packing it. It’s best to place computers, scanners, etc. in their original packing. If you don’t keep it ask the movers for appropriate office packing boxes. Especially protect the computer screen. Use a lot of packing paper and bubble wrap to secure your office equipment. With enough office packing supplies your electronics will be safe. If there is any space left in the boxes with heavy items you can use some smaller lighter things that are unbreakable to fill in the empty spaces left inside. In the end of the office moving packing tips in this article remember to prepare some change of address cards or send out e-mails to notify colleagues and customers. Let everyone know you’re moving. Remember to also explain to your customers if there will be a change in your regular way of work due to the moving and when is your regular regime of work going back so they can be prepared. Hopefully these tips for packing up the office will assist you well in your office relocation. If you have more ideas to share you can always do it like a comment below. If you liked this article please spare a second of your time to give it a g+ from the bar to the left – in this way more people will be able to get advantage of this free useful information. Most mothers know that to save a floor you need to stop the dirt before it enters the house completely. Moms happen to know all the secrets. They clip the dogs and cats nails to keep the floor from getting scratched. Moms know how to brighten a dull surface with a light sanding and fresh coats polyurethane. Slide a chair sock around every leg on the furniture pieces. Always try and lift your furniture to move it from one side of the room to another. Chair socks aren’t sufficient to protect the floor from dragging heavy furniture. Regardless of how careful and cautious you are, you may still find it hard to protect your hardwood floors. Everyone eventually scratches their floor through shifting household furniture all-around. In order to prevent actual wood chippings and floor damages, choose acceptable bottom protectors for your household furniture. Regarding immobile objects for instance large tables as well as sofas, dressers, lower-leg coasters and even large area rugs are usually sufficient to cause floor scratches. Recliners as well as other large goods that a person may move regularly need to be protected. Moving can be one of the hardest projects someone can partake in. Moving can be stressful but it doesn’t have to be so anymore. Information is key especially when dealing with a long distance or a local moving service. The most important key to success is understanding the relocation process. Google any and all questions that you may have, assuring you comfort and perspective along with information. During your moving service, there will be plenty of questions you will want to ask. The most common questions are very basic and everyone should know before the move takes place. We’ve selected the top FAQ that will assist you. What’s the price of my move? This is perhaps the most common ones of all moving company FAQ. Identifying your financial position and the budget you set for yourself, will determine the Moveview™ that you will decide to adhere too. Determining the budget you set for your moving will define when you will move (when you will have sufficient funds to do it), what you will move (the more things you want to take, the higher the cost for the relocation), what moving crew you will hire (the more the moving men, the higher the moving cost), etc. That is why understanding what forms the cost of your relocation is so important. There are several factors that mainly determine the cost of your move: the distance (locally or long distance), the amount and type of things to take (for example, moving larger furniture may be more costly), the services you want to use removals for and the prices of the moving company. This is what you need in order to be able to estimate moving costs. Scratches are damages to the surface layer of the floor. Some of the time scratches are just in the surface. If by chance a scratch goes into the wood, it should just go to the surface level or marginally beneath. Damage to a wood floor that is bigger that a scratch or goes deeper than the surface of the wood is a gouge. A gouge may oblige uprooting and supplanting the harmed board or procuring an expert to make repairs. Clean the scratched area using warm water or a rag dampened with mineral spirits. Allow the area to dry fully before trying to fix the scratch. Disguise the scratch until the time to resurface the floor. There are various approaches to make hardwood floor scratches less perceptible. Place a general indelible marker that is near the shade of your floor. A wide mixture of colors are accessible at specialty stores. Shade scratches with the marker.